Desert ants (Cataglyphis) spend the first weeks of their lives exclusively in the nest. For around four weeks, they nurse the queen and the brood, dig tunnels, build chambers or tidy up. At some point, they leave the nest to start their outdoor career, working as foragers until death. Before an ant sets out to forage, it has to calibrate its navigational system. For this purpose, the insects exhibit a peculiar behaviour lasting two to three days: They perform so-called "learning walks" to explore the vicinity of the nest entrance and frequently turn about their vertical body axes while doing so. High-speed video recordings show that the ants stop repeatedly during these pirouetting motions. What is special about the longest of these stopping phases is that at this moment, the ants always look back toward the nest entrance, even though they are unable to see the tiny hole in the ground. Researchers from the Biocenter of the University of Würzburg have now made the surprising discovery that the desert ant uses the Earth's magnetic field as an orientation cue during these calibration trips. This ability had been previously unknown for desert ants. "While they are foraging for food, desert ants venture several hundred metres away from their nest, pursuing a sinusoidal path that includes larger loops. Once they have found food, they return to the nest entrance in a straight line," says Wolfgang Rössler, describing the ants' astonishing navigational abilities. The researchers had previously known that the ants rely on the position of the sun and landmarks as orientational cues and integrate this information with the steps traveled. To confirm their hypothesis, the researchers traveled to the south of Greece, where Cataglyphis ants are native. They took a 1.5-m-high pair of Helmholtz coils with them. A defined current passed through the coils creates an almost homogeneous, precisely known magnetic field between the coils. 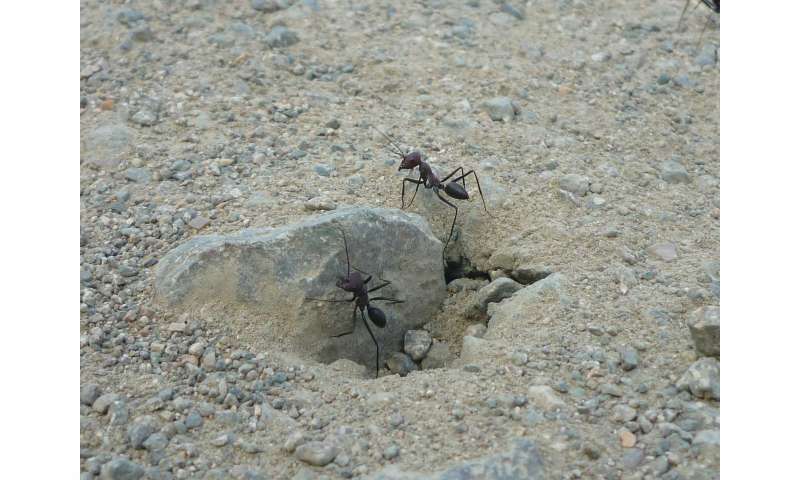 This enabled the researchers to study the behaviour of the desert ants during their learning walks in their natural habitat under controlled conditions. The result was unambiguous: When the scientists changed the orientation of the magnetic field, the desert ants no longer looked towards the real nest entrance but toward a predictable new location—the fictive nest entrance. 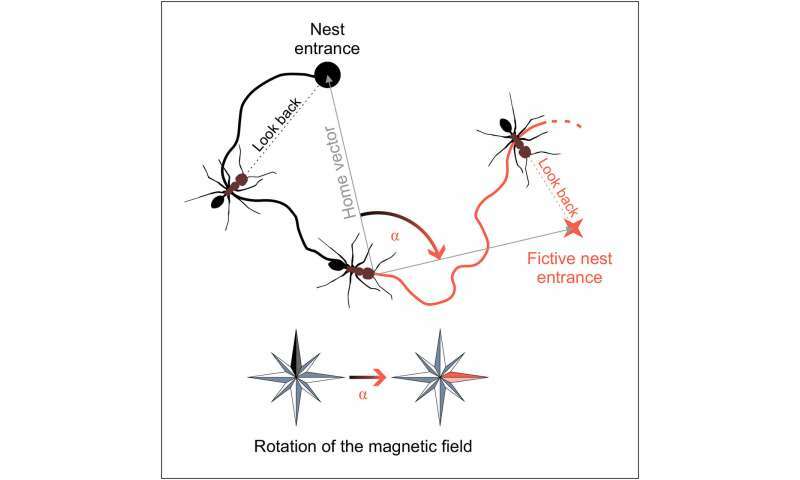 "Their path integration provides them with a new vector to the nest based on the information of the magnetic field," Wolfgang Rössler explains. The scientists admit that they were surprised by this finding. They say that although individual ant species are known to respond to changes in the magnetic field under certain conditions, the necessity and distinct influence on navigation in Cataglyphis ants was unexpected. With this result, the researchers raise further questions. For instance, when do desert ants use their magnetic sense? It might well be that they rely on it during the first weeks of their life underground. After all, a navigational aid can be quite useful in total darkness. But this is only a hypothesis at this point. The second question the scientists want to tackle is how and whether the ants switch between the different navigational cues of the position of the sun, landmarks and the magnetic field. Experienced foragers are already known to perform re-learning walks when they are forced to do so, for example, by changing the environment at the nest entrance. It is unclear, however, whether they also rely on magnetic field cues in this case or whether they use their solar compass as during the foraging trips. And ultimately, there is the overarching question of where the magnetic field sensor is located and how it works. According to Wolfgang Rössler, this question takes you deep into the field of orientational and navigational research in insects. How does the comparably small ant brain manage to store navigational information on the position of the sun, the magnetic field and landmarks, and integrate this information with distance data from their step counter? Rössler believes that this question goes far beyond the field of behavioural research and neurosciences and is of great interest for computer science and robotics, too.